Healthy living at a maintainable pace. First, I want to say thank you so much to everyone for their reactions to my last post. You've helped a ton already, and, with your continued input, I'm excited for this blog to grow even more. 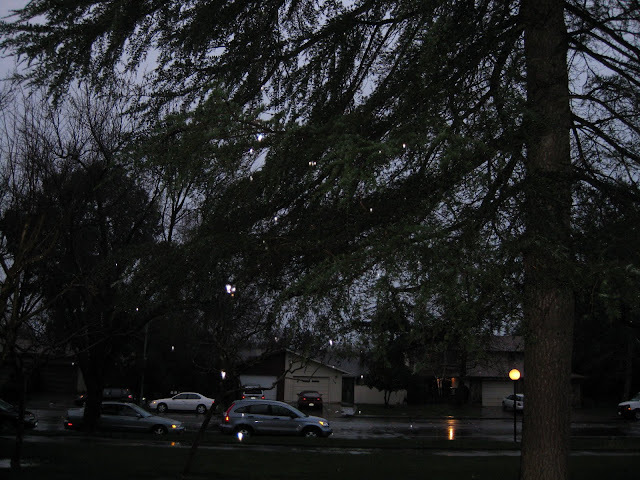 This week in beautiful Northern California it rained for five straight days. I don't mean cute little drizzles. No, this was umbrella-destroying, hair-soaking, tree-shredding, tunnel-flooding Rain with a capital R.
But... at least I had plenty of opportunities to wear my rain boots! Also, since biking around town (my usual mode of local transportation) was not an option, I could bring my longer London Fog raincoat out of retirement. "Oh, Mister Sun, Sun, Mister Golden Sun, please shine down on me!" So, I've been largely relegated to the treadmill this week. Treadmills aren't the worst thing in the world - they can actually be helpful with certain types of runs (I'll explain momentarily) - but for a distance longer than four or five miles, I really don't have the attention span. Tuesday and Wednesday were rest and ice days. I wanted to do some yoga, but I ended up working two 12-hour days, and when I got home I had energy only for dinner and bed. 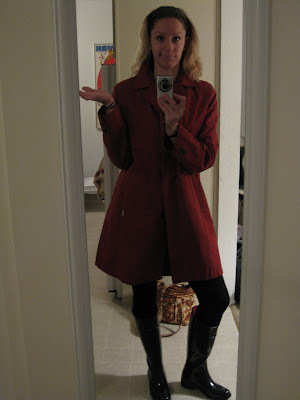 In a fit of optimism, I decided to wear my cold-weather (outdoor!) 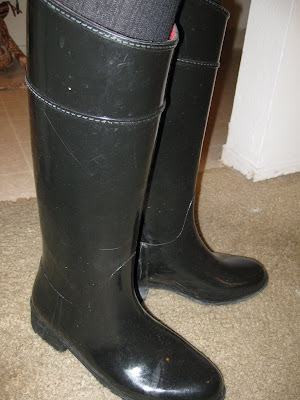 running duds to go to my dentist appointment Thursday morning because the rain seemed to have let up. I had the idea that, once I got home, I could just hop out the door and head out on my route. Unfortunately, the second I got home the deluge began again. So, it was back to the treadmill for interval work for me! I credit speed intervals (repetitions of 400 meter sprints with walking or jogging in between) with most of the improvement in race pace that I have made in the past six months. Whereas distance running usually engages only slow-twitch muscle fibers, speed intervals teach your muscles to activate the fast-twitch fibers as well, giving your legs an added source of power. 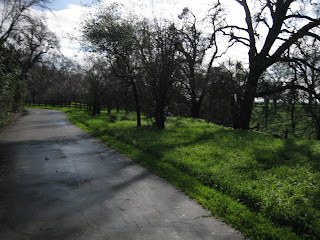 While training for the Healdsburg Half-Marathon, I integrated one day of speedwork into my training every other week. I started out running 4 x 400m in 1:30 each (6min/mi pace divided by 4) with 1:30 walking in between and 1 mile each warm up and cool down. After the third or fourth interval, I usually started to get pretty uncomfortable (notably dry-heaving on a few occasions - sorry for the gross imagery). By the end of my training, I was doing 8 x 400m in 1:30 with energy to spare! And, I had shaved a minute off of my average half-marathon split time!! The (maybe only) cool thing about treadmills is that, when you're trying to run at a specific pace, the treadmill will force you to stay there. For speed intervals, this feature is particularly effective. When on your fast intervals, the treadmill will keep your pace up; when on "rest," the treadmill will keep you at a steady but slower pace when you are exhausted (stay strong - no slacking!). Thursday I did 6 x 400m at 9.2mph, a 6:30/mi pace, with 9:30/mi 400m jogs in between, plus 1 mile warm up run and a cool down walk. 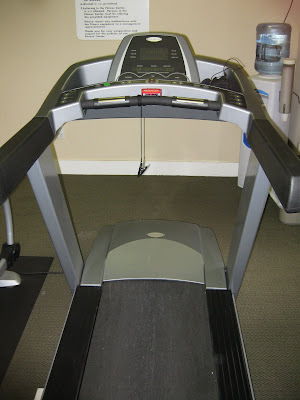 The treadmill in my apartment complex's mini-gym doesn't have certain features that fancier real-gym versions have. For instance, it only reports distance to tenths of a mile, as opposed to hundredths. So, it's hard to judge when I've reached 0.25 miles (that's roughly 400 meters). Also, it doesn't convert the mph that you set into min/mi, so I was doing some long division in my head mid-run Thursday morning. Today I found this nifty treadmill pace conversion chart on the interwebs, so I can look up my goal pace before hitting the 'mill next time. Not sure how the "equivalent paces by incline" calculation works, but I dig it! Friday I didn't delude myself and immediately headed for the treadmill in the morning. I had decided that, in order to make the most of my shortened running week, I was going to do a second type of speedwork - a tempo run. Essentially, "tempo run" means that you run for an extended distance near peak sustainable speed. It's also often good to run "negative split" tempo runs, where you increase your pace every mile or so (so, speeding up rather than slowing down when you start to fatigue). Incorporated into your training over time, these workouts will raise your anaerobic threshold so that your muscles metabolize oxygen longer into a run (rather than switching to glucose metabolism) and better process waste. This means you'll be able to run faster for longer and without cramping. Sounds pretty great, right? Once again, the treadmill had come in handy for speed training! After a cool down walk, I stretched (especially my IT bands) and iced. I also had to scuttle hurriedly through the parking lot back to my apartment - the rain and wind had really picked up. 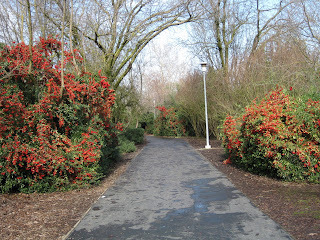 To my delight, I woke up this morning to bright sunshine and blue sky - and couldn't wait to get outside! I grabbed my camera (per childhood best friend and professional photographer Elizabeth's request) and headed out on an "easy" 3 mile run through the bike paths in my neighborhood. 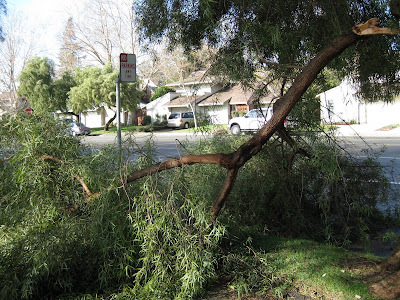 The first thing I saw when I stepped outside was evidence of the havoc the rain storms had wreaked the night before. But, in general, the run was completely gorgeous and it was amazing to be outside soaking in some vitamin D again. [Side note: I don't really understand how sunshine could give you vitamin D - does anybody know how that works?] Including stopping to snap some pictures, I stayed around an 8:11/mi average split. I love my running/biking paths and am pumped to go for an 11-miler on them tomorrow. Even though my some of my usual activities were disrupted by the weather, my food plan for the week went off without a hitch! Breakfasts were vanilla nut coffee and egg whites. 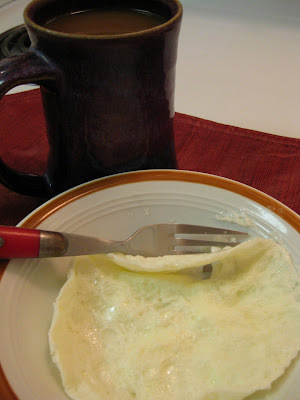 I always buy cartons of just egg whites and pour 1/3-1/2 cup in a microwave-safe bowl, then nuke it for 1.5 minutes. Near-instant protein blast breakfast! 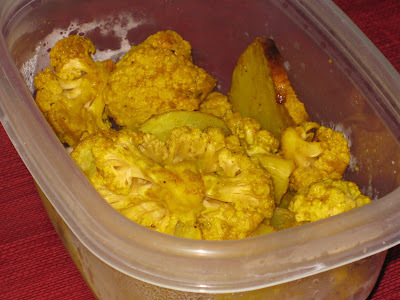 Lunches this week were curried sweet potato, cauliflower, and chicken. Mix yogurt and spices. Pour half into a bowl, set aside. Toss other half with veggies, spread in a greased dish. Roast at 400 for 20-30 minutes. Top chicken breasts with 2 tbsp reserved sauce and 1/6th of the veggies. Microwave until hot. Enjoy! 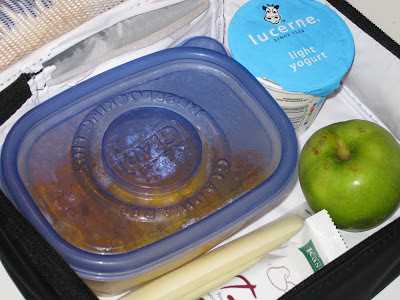 If you work or go to school with me, you're probably quite familiar with my lunchbox :) I pack lunch and snacks in it every day - it's a real money- and calorie-saver. Carry-on snacks this week included (as usual) 2% mozzarella cheese sticks, nonfat yogurts, Kashi Cherry Dark Chocolate Bars, and granny smith apples. Dinners this week were mostly glorious spinach, baked honey sesame tofu, clover sprouts, steamed beets, cherry tomato, dried fruit, mixed nut, and balsamic salads. But, on Thursday night, having ratcheted up my calorie burn with the morning's interval training, I was famished by dinner time and craving something hearty. So, along with a side-salad with tofu, I threw together baked cherry tomato pasta for one. 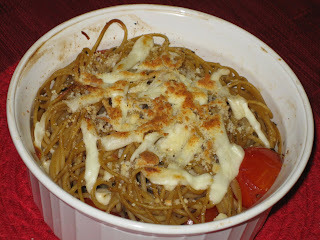 Mix everything but the cheese and pasta together, let sit for 10 minutes while you cook the pasta. 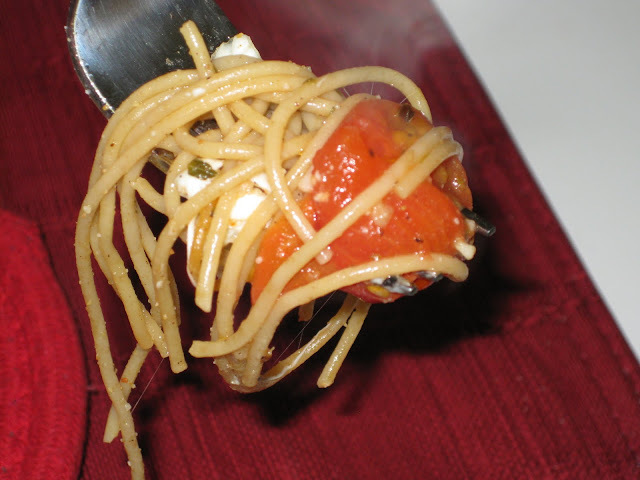 Toss tomato mixture with pasta, add to small baking dish. 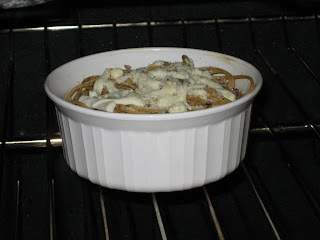 Toss half the mozzarella in with the pasta; top with the other half and the Parmesan. Bake at 375 for 10 minutes. Broil for 1 minute. Enjoy! Look at the steam rising off that beautiful roasted cherry tomato! Mmmm, so savory, tangy, and sweet! Desserts have been multiple bowls of either Kashi GoLean Crunch, Special K Protein Plus, or Special K Chocolatey Delight. 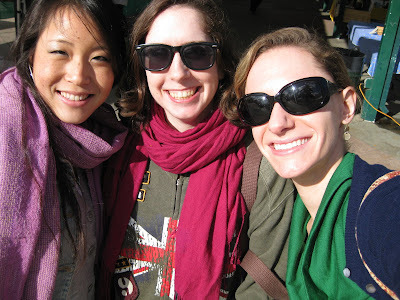 On Saturday afternoon, in celebration of the sunlight, I met Jin and Shannon at the local Farmer's Market for lunch. 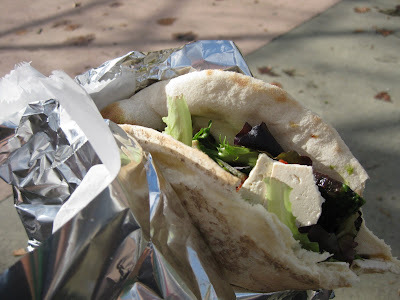 We all ate Indian Naan wraps - I had baked tofu with various chutneys, Shannon had aloo gobi, and Jin had paneer. 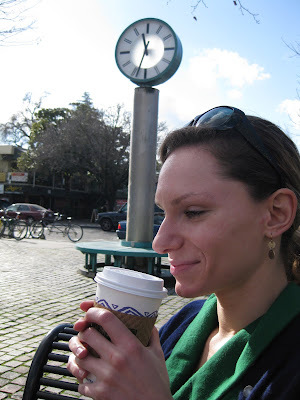 Then we walked downtown for coffee and tea. Hmm that clock is definitely incorrect. 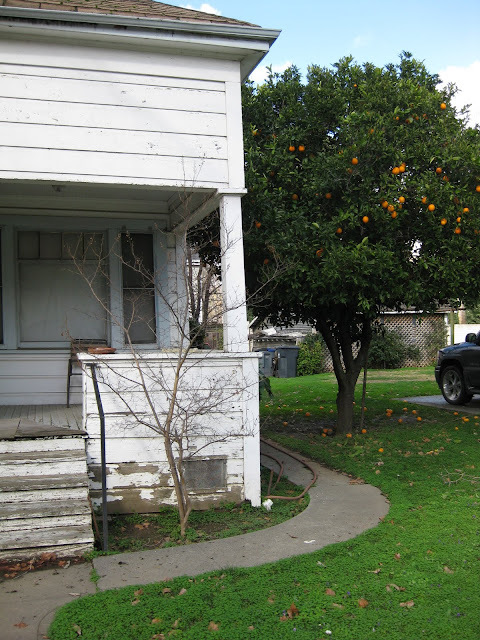 On our walk, we passed one of the town's many impressively lush and surprisingly located fruit trees. Sunday - 11 miler with Renata through the Arboretum! Will definitely bring the camera on this one. Two 3-4 mile "easy" runs. Lots of stretching, especially paying attention to my IT bands - no more knee pain please! Crossing off lots of items on my lengthy to-do list. Dinners - Roasted veggies (brussels sprouts, carrots, mushrooms) and modified tomato pork chops. Today's question: How does the weather impact your life? Does your mood change with the seasons? Are you less productive when it is unfavorable outside - or is it harder to concentrate when you'd rather be playing in the sunshine? Humans make 90 percent of our vitamin D naturally from sunlight exposure to our skin – specifically, from ultraviolet B exposure to the skin, which naturally initiates the conversion of cholesterol in the skin to vitamin D3. Oh, so cholesterol has a purpose other than clogging our arteries? Thanks erstwhile, <3 you! Just got back from my 4 mile treadmill run at the ARC. THANK YOU for motivating me when I am going through a serious case of bump-on-a-logness. Your pep talk this afternoon really helped. I did the run on a somewhat quicker pace than usual and I felt great after. I'm also glad that I read your post AFTER my run so now I don't feel so guilty about almost not having ran (or is it not having run). Anyways, glad you are doing this blog bc it's a great way to stay accountable and your posts show that you really care about what you write about! So.... 11 miler next, huh? I must say, I love that you are using Laura-lingo throughout the blog. Good ol' "interwebs," and although I've never actually heard you refer to a treadmill as the "'mill," it is a very Laura-ish thing to say as well. Mmmm, that pasta looks fantastic!! I love working out when it is a bit cooler outside (not blistering heat). I love the rain ... there is so much snow where I live, and I am SICK of it. We got stuck today :-( I can't wait for spring!! The weather majorly impacts me. Here in SoCal, it's been awful with all this rain. We're not even used to clouds, let alone torrential downpours. It was a mostly sunny day today. LOVED it. Your pics are gorgeous, by the way. Well, here in PA I definitely choose to workout indoors in the sub-freezing temps of the past few weeks and conversely lust after running outdoors when the weather is nice (like yesterday, when I got lost and doubled the length of my run, haha). I used to get moodier if it wasn't nice outside, but my boyfriend and I are both thankful that phase is over. I haven't fully explored your blog yet, but it seems like you're a very experienced runner, what with how frequently you run and distances, etc. I definitely look forward to reading your page as I train for my first half marathon! Laura, you have definitely inspired some delicious and more creative meal-making. I'd like to say you've inspired in me more elaborate and effective run sessions but that's too complicated for me. Plus the plantar fascitis in my foot is keeping me from running (I see the podiatrist tomorrow). Yes treadmills are boring. But have you seen the treadmills and bike machines with cable tv at the ARC? Since the weather has sucked, I have been biking on these machines and catching up on ESPN at the same time. And I've been pleasantly surprised at the Yoga classes at the ARC. I like the Mon and Wed class at 5pm. It's been good for injury prevention / rehab. To answer your question, I am a completely happier person when it's sunny outside. Of course, I'm most happy when it's sunny and I'm at the beach, but I guess I have to adapt... 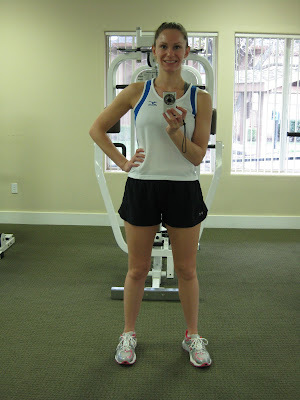 Thanks for this blog, such a motivator!